Norfolk County Council has agreed a loan of just over £2 million to fund the development of the Beach Coach station car park. 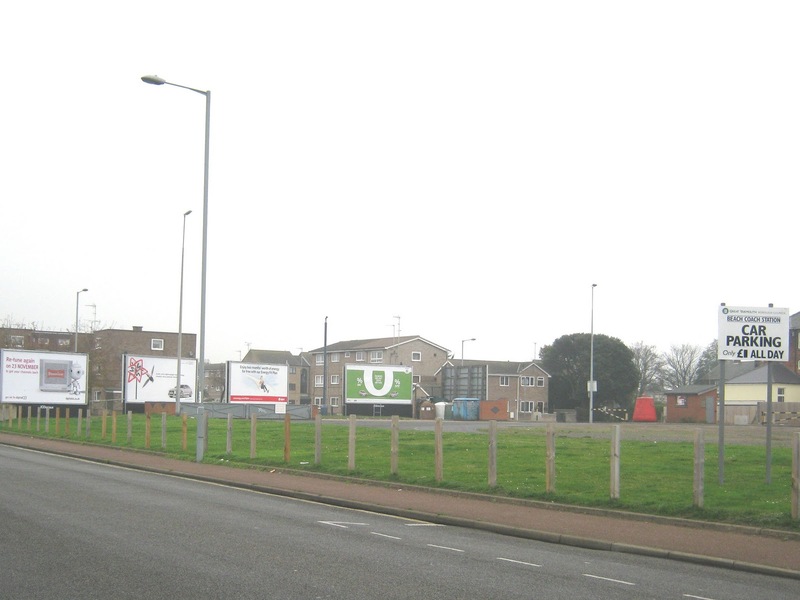 The money is to be used to build 19 homes at the car park which is located at the northern end of the site. It will also fund a new entrance to the site. 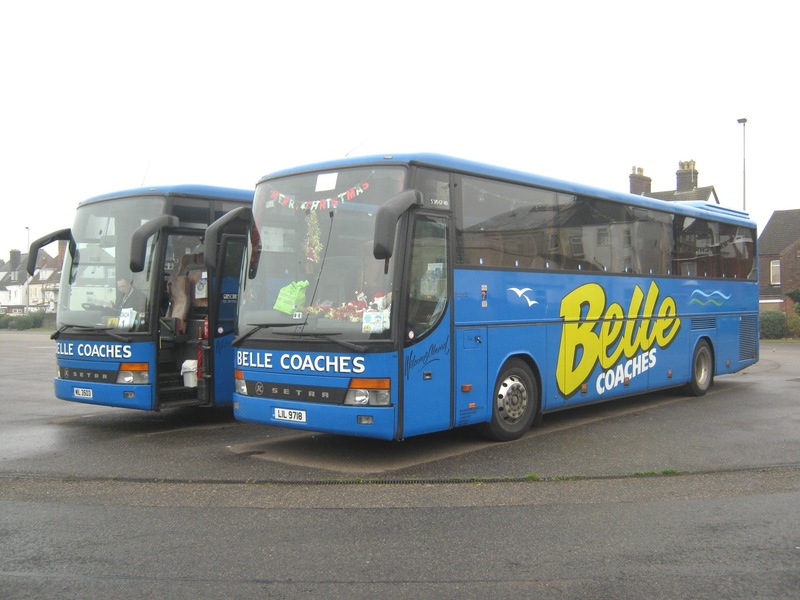 Two Setras from Belle Coaches were parked up at Beach Coach Station this afternoon. Both 37 (MIL5303) and 46 (LIL9718) were thought to be laying over prior to working their return to Suffolk. Shortly after lunchtime today three First Eastern Counties vehicles were noted on Bernard Matthews contracts. The first to pass me was 34110 W437CWX) (below) with 'Contract' displayed but with no passengers. This vehicle is the final production Volvo Olympian with Alexander Royale bodywork. Next up was sister vehicle 34111 (W431CWX) displaying '...Sorry Not In Service...' but carrying passengers! As 34110 arrived via different route, I can only assume that 34111 was experiencing problems and that passengers would transfer from one to the other at the next stop. Normally only two deckers are used for Bernard Matthews contract work at that time. Following closely behind was the recently resurrected Olympian 34333 (H132 FLX) with 'Contract ' displayed and carrying passengers. 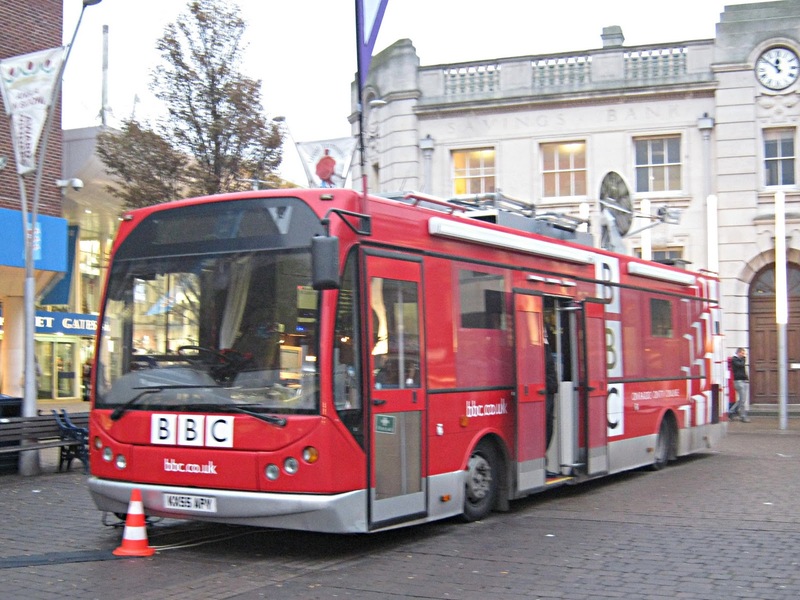 Pictured in Great Yarmouth Market Place this afternoon was this BBC owned vehicle. 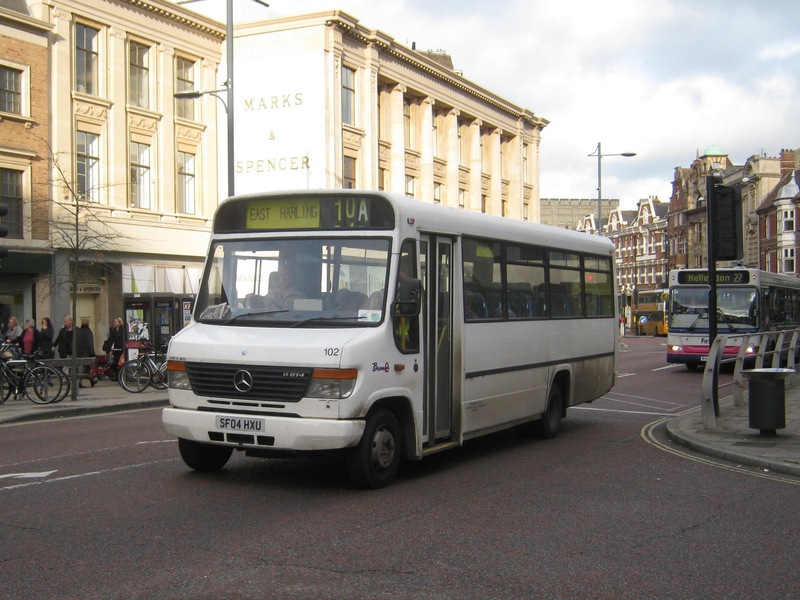 KX55APY is a 2005 MAN with East Lancs Myllenium bodywork. It is thought that it was being used in conjunction with the digital television switchover later in the month. Another withdrawn Dart has left the depot with 43450 (P450NEX) being recently collected by Erith Commercials for scrapping. With Christmas almost a month away (oh no I hear you say!) a timely visit was made yesterday to the Lakeside Shopping Centre in Thurrock, Essex. As well as the shopping, there was also an opportunity to view bus activity serving the centre. The principal operator is the family owned business of Ensign - also well known as one of the UK's largest used bus dealers. So having been given approval (!) to get out of the shopping, I made my way through Debenhams and out to the bus station. My first sighting there was Ensignbus Dart 771 (M871MCE) which was laying over between duties. Also awaiting its next working was First London﻿ Dart DML41431 (LN51DWU) having arrived on the 265 route from Brentwood. First Essex also had a presence with its Scania/Wright Solar 65666 (SN51UXY) the next to appear. Sister vehicles have recently transferred from First Essex to Norwich. Arriva Southend's 3971 (YE06HPX) was then seen approaching the bus station nearing the end of its 370 journey from Romford. Former Alexander Dennis Trident demonstrator 123 (SN59AWV) was then noted on the stand at the bus station looking very smart in Ensign's silver and blue livery. Further recent additions to the Ensign fleet include two former Sanders of Holt East Lancs Olympus bodied Volvo B9TLs. Above is one of them, 121 (PL08YLZ) is on the X80 service linking the Lakeside and Bluewater Shopping Centres. As I was about to return to the shopping centre, Stagecoach London's Alexander Dennis Trident 19730 (LX11AZT) arrived on the stand. I quickly tried to get a photo of it just as it was about to pull away; but I was too slow! However, the driver immediately stopped and manoeuvred his vehicle into position so that I was able to get a good picture of it! How unusual to get such a helpful driver, who then acknowledged my thanks before proceeding to his next duty. Just over an hour then watching activities at Lakeside Bus Station which afforded some different vehicles in different liveries. Worthwhile escaping from the shopping! Noted at Birchanger Services, near Stansted Airport yesterday evening, was former London Transport Routemaster RML 2498 (JJD498D). 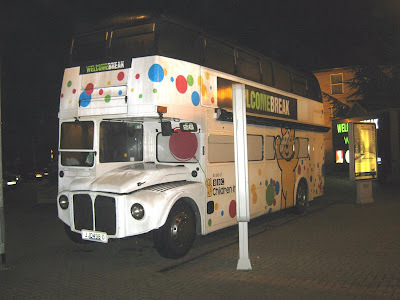 Owned by Wecome Break, the Routemaster had been used as a coffee bar at a number of their locations. RML 2498 was promoting the BBC's Children In Need appeal. I spent a little time in Norwich today on business but it did allow for some observations around the city centre. Konnectbus was using MAL96 BD57WCZ on the Costessey Park and Ride and is pictured above at St Stephen's roundabout. She is still in red livery with 'part of the Go Ahead Group' displayed on the both of the two vehicles next to the bendi join on the drivers side. 'Go Ahead London' was shown on the opposite side. 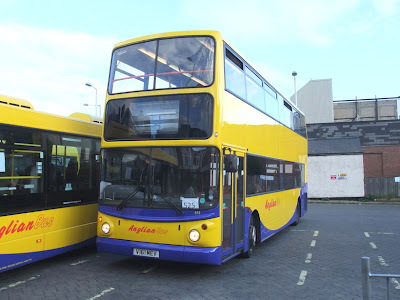 At least two of Anglian's three new Scanias were noted in service. 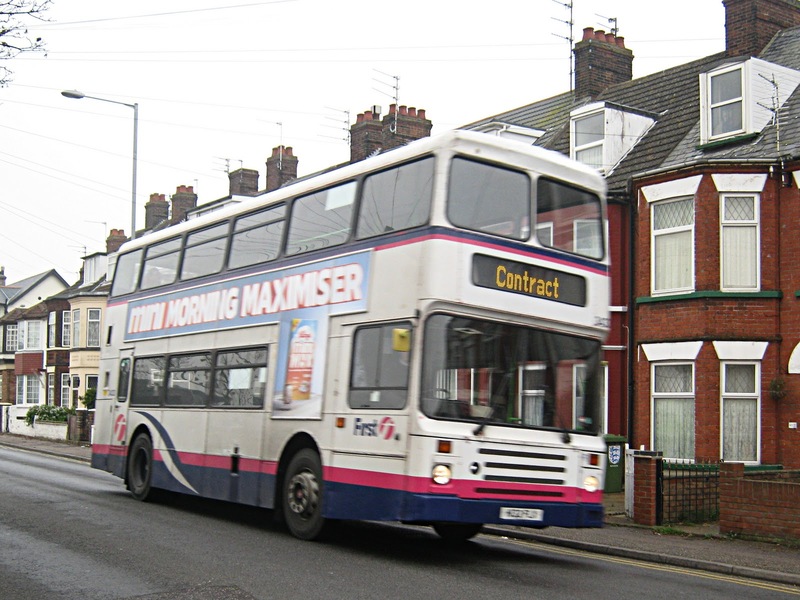 Both 440 (AN61BUS) (seen above) and 441 (AN61AVK) were employed on the 123 route between the city and Wroxham. 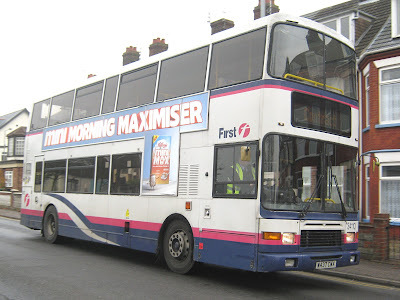 Chenery's Volvo B12B FJ05AOV was on National Express work. Here she is about to depart Surrey Street Bus Station with the 14.45 490 service to London. Finally, making an appearance on St Stephen's Street was Semmence & Company's Mercedes 102 (SF04HXU) with 10A East Harling showing on its destination screen. Variation Accepted: Operating between LOWESTOFT BUS STATION and PETERBOROUGH RAIL STATION given service number X1 effective from 03-Jan-2012. To amend Stopping Places and Timetable. Variation Accepted: Operating between LOWESTOFT and MARTHAN given service number 1/1A/1B effective from 03-Jan-2012. To amend Timetable. Variation Accepted: Operating between Great Yarmouth, Market Gates and Bradwell/Belton given service number 6/6B/7 effective from 03-Jan-2012. To amend Timetable. 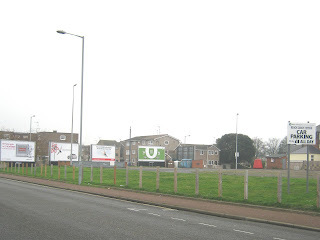 Variation Accepted: Operating between Great Yarmouth, Market Gates and Burgh Castle given service number 5 effective from 13-Dec-2011. To amend Timetable. * The above information was sourced from the Vehicle and Operator Services Agency bus registration search and is subject to Crown Copyright. 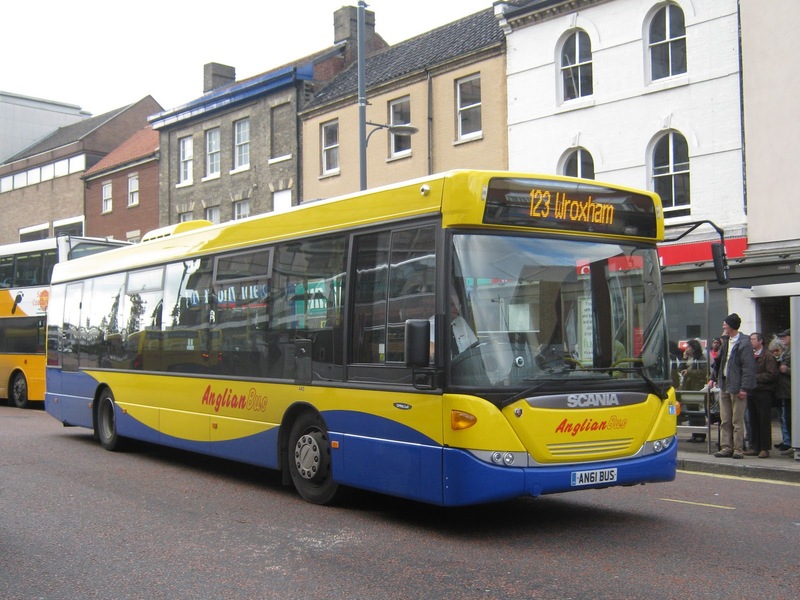 The importance of Norfolk County Council's Fair Fares Concessionary Travel Scheme campaign is highlighted in a report to be presented to its Cabinet today which warns of higher costs during the next financial year. In the current year the Government allocation to Norfolk is £7.3m - some £4.5m short of the actual coat of running the Scheme. 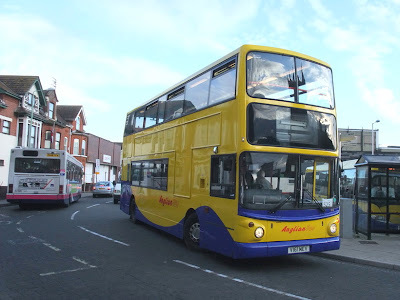 The County Council and bus operators have agreed to share some of that shortfall, but that still leaves a £3m burden on Council Tax payers and a strain on other services, including rural transport support. At least 12,000 people have already joined the campaign calling on the Government to fairly fund the concessionary bus scheme. Fair Fares has also been gathering momentum nationally with Buckinghamshire County Council pledging wholehearted support for the Norfolk-led campaign. Yesterday meant a day in Bury St Edmunds and the opportunity to view the new BREEZE branded town services operated by Stephensons of Essex. However, my first sighting was that of First Eastern Counties Dart 43475 (R475CAH ) on the the 83 service to Westley Court pictured on St Andrews Street South. Then, before I could get my first picture of one of the new BREEZE vehicles, my camera's field of vision was briefly interrupted by Mulleys BMC Falcon YN54VLE! At last I got my picture of Stephensons Dart 439 (Y284FJN) on Breeze 2 to Howard Estate, situated in the north of the town. As expected, most of the BREEZE promoted services were operated by the recently acquired Stagecoach London Darts. 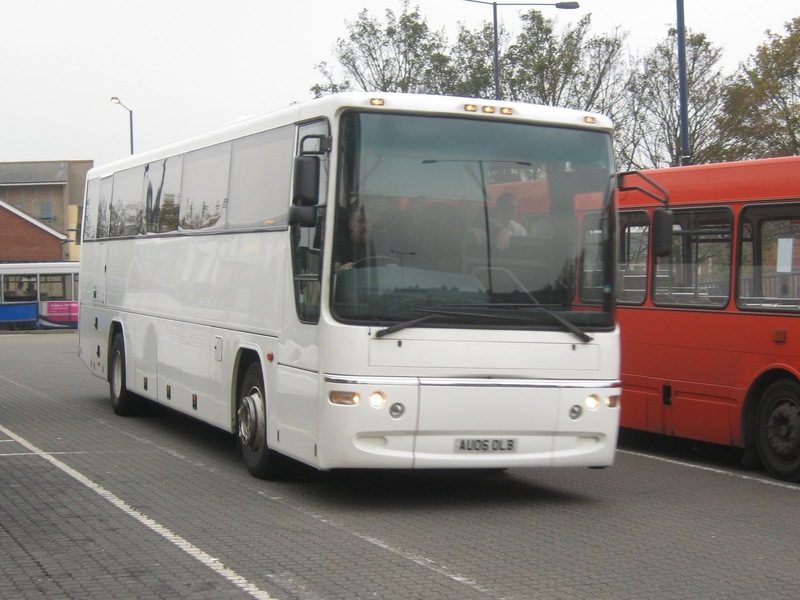 Another example was 435 LX51FGE also heading for the Howards Estate. Most of the Mulleys vehicles I saw had large poppies displayed in the front windscreens - this was Solo MX57HDH on the M44 Mildenhall & Howard Estate Circular. After its arrival, I wondered around to the layover area to the north of the bus station to see what was about. Immediately I saw AU06OLB heading towards me. After some research I found this to be a Ministry of Defence vehicle used to ferry around soldiers/personnel. As dusk began to fall, I photographed my last Stephensons Dart on southbound BREEZE 1 to Nowton Estate. An interesting day with a variety of companies operating services in Bury St Edmunds. It remains to be seen as to how much the new BREEZE routes will impact on First Eastern Counties town services. Surprise news from Great Yarmouth's Caister Road depot is the reinstatement of First Eastern Counties Leyland Olympian 34333 (H132FLX), less than a month after withdrawl. After a safety service and check (which really only required replacing bulbs etc that had been canabilised from her since withdrawal) she was back on the road again yesterday afternoon on Bernard Matthews duties. As reported on the blog yesterday, Anglian's fifth former Stagecoach London Trident is now in service. Sporting its new Anglian colours, V161MEV was seen arriving at Lowestoft Bus Station on the 525 service during this afternoon. Syd Eade was on hand to record the event. V161MEV's centre door has been removed and the driver says that it now has 88 seats. (the fleetlist says 80!). The vehicle has yet to be fitted with destination blinds and has just a bit of card in the window for the route number but no clue as to whether it is on the Carlton Colville shorts or running through to Beccles. Beccles-based Anglianbus, which operates on many routes through the East Norfolk area has recently published its latest fleetlist on its website. The three new Scania Omnilinks have been registered AN61LAN (439), AN61BUS (440) and AU61AVK (441). Number 439 is operating from Beccles whilst 440 and 441 are located at Rackheath, Norwich. A fifth ex-Stagecoach London Trident has been acquired in the shape of V161MEV. 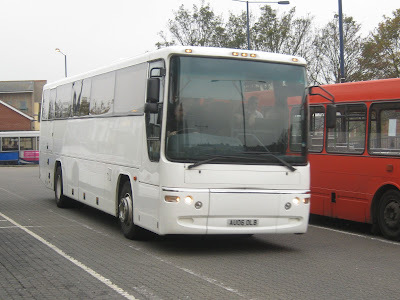 The 80 seater is currently at Beccles and was noted earlier in the week in a 'rubbed down' state in the yard of Car and Commercials in the Suffolk town. It has subsequently been reported in Lowestoft this evening wearing Anglian fleet livery. 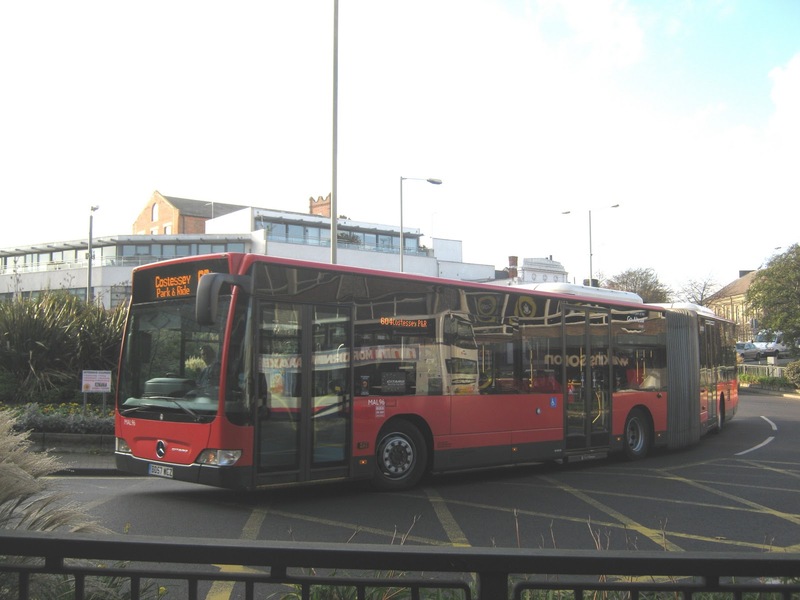 Recently acquired Optare Solo YN04LWP has become 326 in the fleet and is also allocated to Rackheath. There is no mention in the fleetlist of Wright StreetLite MX60GXC which is believed to have been on short term loan from dealer Mistral. Great Yarmouth's Swift Taxis was using a newly acquired Volvo B10M on Sprowston School and other services during late October. Swift Quail is pictured here on Acle Road in South Walsham on 29th October by Joe who runs his own blog under the name of Norwich Bus page. My thanks to him for allowing me to use his photograph. Wednesday is market day in Great Yarmouth which normally attracts a small number of visiting coaches. Today was no exception. 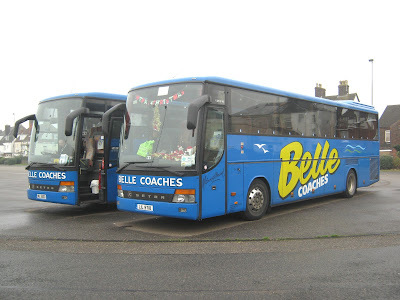 Lowestoft-based Belle Coaches usually runs a shoppers service from Lowestoft to the town and today this brought Setra 04 (LIL9713) to Great Yarmouth. She is seen here just after lunch at Market Gates Bus Station loading passengers for the return journey. The vehicle generally lays over at Beach Coach Station. At Beach Coach Station there were ten present including another Setra. This time it was BK11GJZ from the Shearings fleet in Grand Tourer livery and bearing fleet number 310.